I looooooove sweet and smoky, or sweet and spicy, or sweet and smoky and spicy all together! This Sweet and Smoky Bacon Chili will leave you coming back for more. It’s got just enough sweet from the sweet potatoes, just enough spicy from the chili powder, seasonings and chipotle peppers, and a nice smoky element from the smoked bacon and also the chipotle peppers. Sweet- Sweet potatoes and raw honey. I added sweet potatoes for a few reasons. First of all, they are delicious. Sweet potatoes are one of my favorite starchy carb sources, they are packed with vitamins A, C, B5, B6, & E, plus Manganese and Potassium. They also add a much needed sweetness that balances the spicy and smoky elements. The raw honey helps balance the spiciness and the acidity from the tomatoes. Smoky- Chipotle peppers, smoked bacon and cumin. I love the rich smoky flavor that chipotle peppers en adobo give. They are basically smoked and dried jalapenos that are reconstituted in a tomato, vinegar, garlic sauce. A little goes a long way, trust me! I almost killed my whole family a few years ago for Christmas when I added a little too much to my whipped sweet potatoes, oops! The other smoky element comes from smoked bacon. The bacon was actually not in my first attempt at this dish, only because I didn’t have any thawed out and ready to go at the time. However, it gives a nice smoky flavor and who doesn’t love bacon? Cumin is one of my favorite spices to use! It gives a nice earthy and smoky feel to dishes and is commonly found in curries and taco seasoning. It’s one of my secret ingredients to my guacamole! Gut Healing- Bone broth and collagen peptides. Anywhere I can sneak in some extra gut-healing, I go for it. I have been using bone broth in place of regular broth for awhile now because of the extra health benefits it offers. Bone broth is basically broth cooked for much longer, up to 36 hours, and made primarily with bones and some aromatics. Regular broth/stock is cooked for a much shorter time, up to a few hours, and is very light in flavor and texture. Bone broth is rich in protein, minerals, and gelatin. I’ve also included collagen peptides as a bonus to get in even MORE gut healing collagen! Collagen protein is tasteless and does not contribute to the flavor in any way. Fat-burning and brain health- MCT oil. Another boost I’ve been adding to most of my recipes is a highly concentrated form of coconut oil called MCT oil, which is a blend of medium chain triglyceride fatty acids from the heart of the coconut. These are 6 times more powerful than regular coconut oil and for those of you who don’t like the coconut flavor, this is flavorless! My favorite brand is by Bulletproof, called XCT oil, which is 10% off for the month of February! This is one of those dishes that you want to make a large pot of and save some in the freezer so you have a delicious meal you can grab and reheat without thinking. It’s perfect for anytime of the year, but especially good on cold days where you want to bundle up in the house with blankets and movies on Netflix! And, especially good on Super Bowl Sunday which is this weekend! So make a huge batch. Enjoy it with your friends and family. Heat dutch oven/stock pot over med-high heat, add chopped bacon and cook until just browned, Then add ground beef and cook until browned and add onions, garlic, tomato paste, chipotle peppers and their liquid, chipotle seasoning, honey, chili powder, cumin. Stir and cook for 10 minutes. Add fire roasted tomatoes, bone broth and collagen peptides if using, then bring to a boil. Next, add diced sweet potatoes and cook on medium for about 25-30 minutes. Taste chili and add salt and pepper to taste. At this point you can also add more honey if you find it too spicy/acidic. If the chili is not thick enough, just turn heat up and bring to a boil while stirring frequently to reduce some of the liquid out. Enjoy with whatever toppings you like! Here's where I'll drizzle a little of the MCT oil for added fat-burning effect, cilantro for detox, and radish for a nice cool crunch! Make this NOW and tag me on Instagram so I can see it! Use hashtag #thefeistykitchen!! I looooooove sweet and smoky, or sweet and spicy, or sweet and smoky and spicy all together! This Sweet and Smoky Bacon Chili will leave you coming back for more. It’s got just enough sweet from the sweet potatoes, just enough spicy from the chili powder, seasonings and chipotle peppers, and a nice smoky element from the smoked bacon and also the chipotle peppers…. I like my meatballs to be full of flavors not just blah balls of meat. And I like big flavors. So, I made sure to add some big flavors to these. I must say they taste pretty darn good. Hubby agreed and ventured to say these were by far the best ones I’ve made yet. That’s all I needed to know to label them Best Meatballs Ever! He’s a very honest food critic and I value his opinion as my number one taste-tester! I originally called these “Greekish 50/50 Meatballs” due to the fact that they have some Greek flavors with the addition of the green olives, and I used 50% grass-fed beef and 50% pastured raised ground pork. I had on hand some Double Stuffed Green Olives (with jalapeños and garlic cloves) made locally in Corning, CA, known as the “Olive City,” at the Olive Pit. You can definitely use any olives you have on hand. In fact, that’s generally how I come up with many of my recipes. I look in the pantry and refrigerator and pull out things I think will pair well together and go from there. I highly recommend the “free style” cooking method in the kitchen! 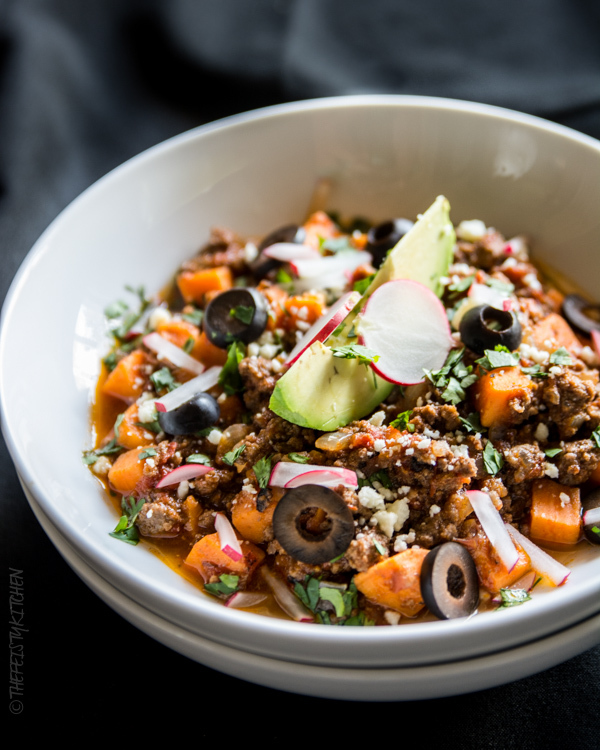 This recipe also highlights the amazing protein from 5280meat! I know I already mentioned this before, but I buy all my grass fed beef and pasture raised pork products from them. Their customer service is amazing and I know these animals are raised humanely and Rachel and Ty give them a great life while here on the earth. Plus they aren’t pumped full of antibiotics or hormones, so that is huge to me and has definitely made a difference in helping me heal my Hashimoto’s thyroid condition. I am currently doing a Whole30, and I never eat regular pasta anymore since the gluten doesn’t like me, so I came up with something new. The cabboodle. I have try zoodles many times and they are ok. But you have to have a zoodler, or a fancy peeler, or a some cool kitchen gadget that I probably don’t have. I love shredded brussels sprouts and cabbage is pretty much just humungous brussels, so that works for me. 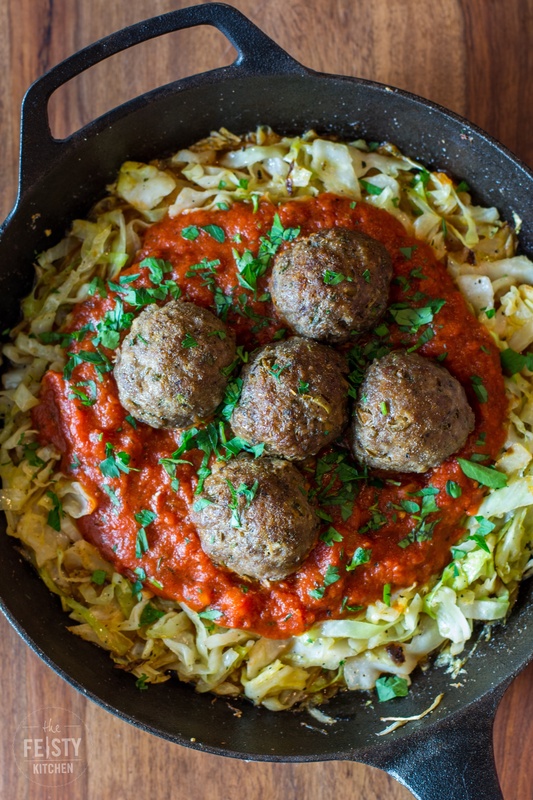 My brother actually made my meatball recipe the other night and told me he added shredded cabbage to the cast iron skillet after cooking the meatballs and he loved it. So, cabboodles it is! Oh, and I did declare on my Instagram the other day that according to me, zoodles are so 2014, and cabboodles are now in! Everyone can thank me later, so go to the store and grab some cabbage! You’ll only need a knife and a cutting board to slice them up and throw them in your skillet with some ghee. I hope you enjoy them as much as I do! Serve with pasta, zoodles, or my new favorite thing, ‘cabboodles’ which is shredded cabbage and your favorite clean marinara sauce! I love burgers. No seriously, I mean I could probably eat one every day! I was making so many burgers over the summer that I was nicknamed “The Burger Queen” by my Instagram followers! It is only fitting that my first official blog post be a burger. So here’s one of my favorite burgers I made over a few months ago. Burgers are a year round thing for me so this can be made any time you are craving tons of flavor! I tend to make the majority of my burgers with grass fed beef from my friends Rachel and Ty at 5280 Meat in Colorado. But you are welcome to change it up and experiment with bison, ground turkey or chicken, or maybe even salmon! The more I post my burger pics, the more you’ll notice that I don’t use buns. I tend to eat them “low-carb” style with some type of lettuce. Oh, and before you ask… My burgers are generally the kind you’ll need a knife and fork for! I love getting creative with my toppings and I view creating food as an art project. I love making it look pretty and colorful with some BIG flavors. This one is topped with a simple guacamole and one of my favorite brands of raw kraut from Farmhouse Culture , Smoked Jalapeño flavor! Muey Caliente! And last but not least, you’ll also notice that ALL of my burgers are seasoned with one or more of Flavor God seasonings. In my opinion, these are the best seasonings on the market! 1 lb grass-fed beef (5280 Meat is my choice!) or this would be great with ground turkey! Gently mix together burger ingredients and form into 4 patties. Grill, bake, or pan-sear until cooked how you like. Assembly with toppings and enjoy!